Chef Frederic Chabbert's French cuisine complements the elegantly styled dining room and dramatic views. 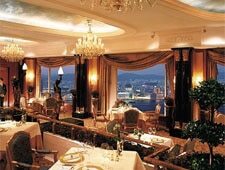 : Experience classic French cuisine set against dramatic views of Hong Kong and Victoria Harbour. Crystal chandeliers, elegant drapery and surrealist images painted across the dome-shaped ceiling display the opulence of the restaurant's grand interior. Chef Frederic Chabbert brings skills learned in kitchens like Alain Ducasse’s Le Louis XV in Monaco to this seasonal menu that features dishes like blue Brittany lobster and tomato salad with Niçoise flavors; raw langoustine tail with caviar, Japanese green tea cream and Sarawak black peppercorn; or the crispy black truffle tart with smoked Alsatian bacon potatoes and black garlic. The restaurant is a favorite among gourmand vegetarians for Chabbert's extensive list of green edibles, including warm young Greek vegetables in tomato concassé with North African spices, and Tuscan pasta with aged Parmesan, marjoram and black truffle coulis. Dessert rounds out the meal on a high note, especially if you choose the dark chocolate plate sprinkled with sea salt and accompanied by homemade vanilla ice cream. The Alsace and Burgundy rooms create an intimate setting for private parties and a wine cellar allows for an extensive wine list with over 20,000 bottles.